Until the early 20th Century, northern Michigan was almost completely dependent on waterborne commerce for all of its needs. Thousands of sailing vessels and early steamers plied the Great Lakes at a time when there were almost no aids to navigation to guide them along the dangerous coastline with its treacherous rocks, shoals and reefs. One such reef extends 1-12/ miles out into Lake Huron at Sturgeon Point, just north of Harrisville, Michigan. In 1869, the Lighthouse Service began construction of the lighthouse at Sturgeon Point to mark this hazard. 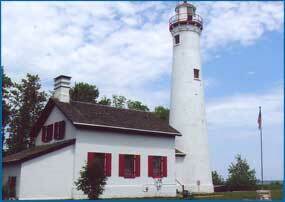 Sturgeon Point Lighthouse became operational in the spring of 1870 and has been in continuous service for 137 years. It is still an operational lighthouse. In 1876 the U.S. Life Saving Service established a Life Saving Station just south of Sturgeon Point Lighthouse. This station provided around-the-clock rescue capability for vessels in distress. With the formation of the U.S. Coast Guard in 1915, Sturgeon Point became a Coast Guard station. The lighthouse was electrified and automated in 1939 and the last personnel left in 1941. The Coast Guard buildings were subsequently destroyed, however, the lighthouse itself survived but was severely vandalized. In 1982 the Alcona Historical Society leased the lighthouse and began a three year restoration project. The interior of the keeper’s house was completely restored, and the buildings were painted. Almost all of the work was done by volunteers. The lighthouse and keeper’s house are of masonry construction on a limestone block foundation. The tower is 70 feet, 9 inches tall and is 16 feet in diameter at its base. The light is a 3.5 order Fresnel lens made in Paris, France. The light apparatus is still maintained by the U.S. Coast Guard. The keeper’s house is now a maritime museum which is open to the public seven days a week from Memorial Day to Labor Day Weekend. The lighthouse tower is open to the public. The grounds are open all year.